This is a delightful recipe that your whole family will love. It's comfort food that's nice enough to serve to company. The apples are so tasty with the pork. Preheat oven to 357 degrees. 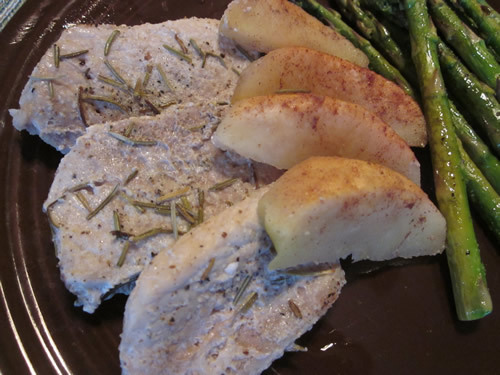 Slice pork tenderloin into 1 inch thick slices and place in the bottom of a 9 x 13 glass baking dish. Pour in the wine and apple cider. Sprinkle the top of the pork with pepper, garlic powder, and rosemary. Bake 30 minutes or until pork is done and apples are slightly tender. 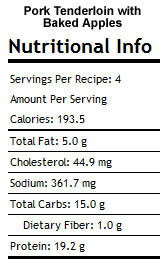 Serving Size: Makes 4 servings. 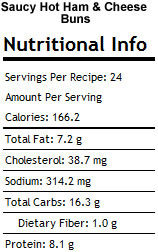 I was looking for a way to make a healthier sloppy joe that still tasted good, so I decided to try chicken. 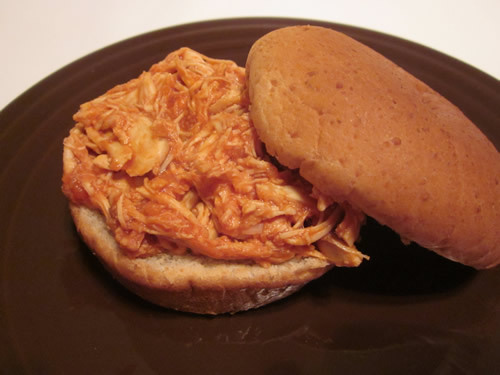 I make shredded BBQ chicken quite often, but I wanted the taste of regular sloppy joe sauce. This version is pretty much what I wanted. 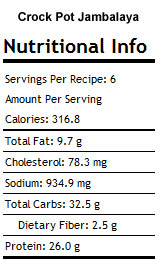 It has MUCH less sodium than using the packages of sloppy joe mix that I traditionally use when making them with ground beef. This would freeze very well. Mix all ingredients together in a medium saucepan on the stove. Heat through. 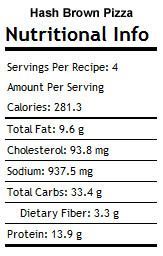 Serve on hamburger buns (not included in nutrition info). Tomorrow, my son turns 16! It's amazing how quickly time flies. This weekend we celebrated his birthday with his friends. We took 10 teenagers to his favorite Japanese restaurant, and then came back to our house so they could hang out and have birthday cake. I made him a chocolate ice cream cake, which was a huge hit. We also spent some time visiting my parents this weekend. I made Corey's birthday dinner tonight since it would take too long to cook on a school night. It was a busy, but nice weekend. This week track meets kick in. We will have lots of evening activities, but I think I have the menu planned well and have enough stuff pre-cooked that we will be good to go. 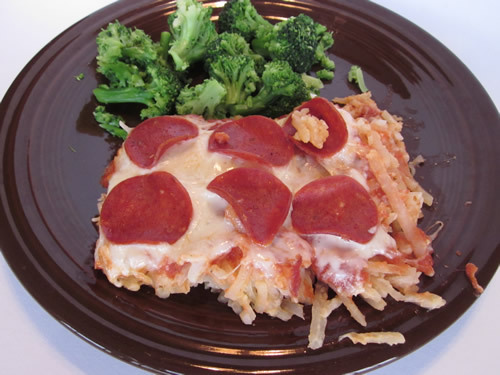 Be sure to check out last week's Hash Brown Pizza recipe (sorry it took so long to post) - it was a good one. My lunch soup this week is Refried Bean Soup. 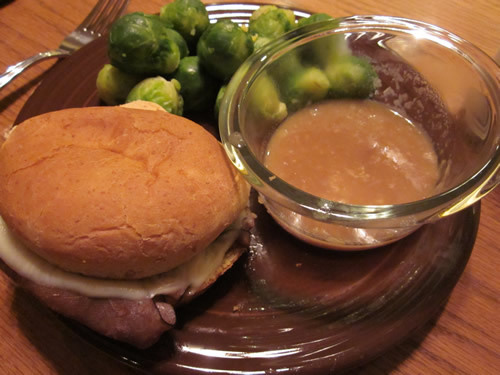 I'll be experimenting with a new pork tenderloin recipe on Wednesday, so if it is successful, I'll post the recipe later. This is a different take on pizza. It's pretty easy to make, and you could substitute whatever toppings you like for the pepperoni. In a large mixing bowl, beat the egg. Add in the hash browns and flour. Stir to combine. Pour into a 2 quart baking dish sprayed with no-stick spray. Bake for 30 minutes or until potatoes are slightly brown on top. Remove from oven and top with pasta sauce, cheese, and pepperoni. Return to oven and bake for 15 minutes or until cheese is melted. Spring break is over and it's back to work this week. Our spring break was a little different than usual this time as my dad had to have surgery, so we spent a lot of time at the hospital. Corey and Eric did make it to Corey's college visit on Tuesday, which was very good, and we took advantage of the 80 degree day today and went for a hike in Arkansas. If you ever have the chance to go to Alum Cove, do it! It was very pretty. Needless to say, I didn't have a lot of time this week to do any kind of advanced planning, and I was thankful that I already had meals ready for the week. I'm going to keep this post short and just get the menu up for you. I'll have to post the recipe for the potato pizza later in the week. 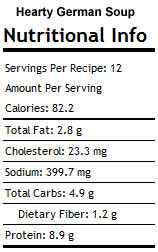 My lunch soup is Hearty German Soup (82 cal). Friday - Corey's 16th birthday party! These are great for parties or family get-togethers. 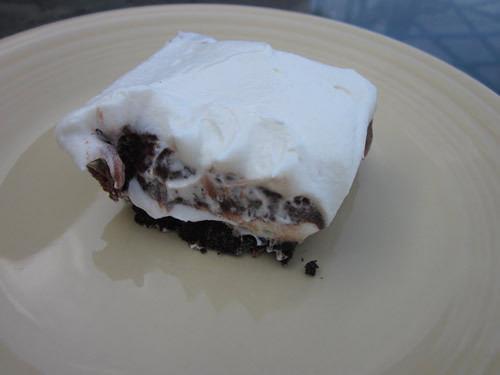 Cut the rolls in half and line the bottom of a sheet cake pan with the bottoms of the rolls. 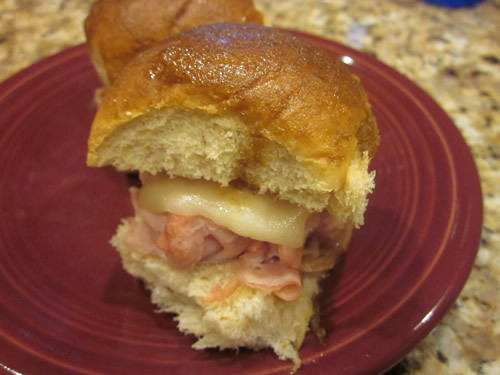 Evenly divide the ham and place on each bun and top with a fourth of a slice of cheese. Place the tops of the buns back on the sandwiches. Mix together the melted butter, Worcestershire sauce, mustard, brown sugar and onion powder. Use a basting brush to liberally coat each sandwich until all sauce is used (you can just pour it over the tops if you wish). Cover the pan tightly with foil and place in the refrigerator to marinade anywhere from 4-24 hours. Preheat the oven to 350 degrees. Bake for 15 minutes, or until cheese is melted and bun tops are golden. 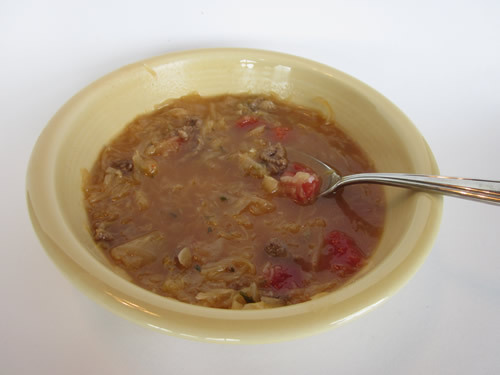 For those of you who love sauerkraut, you will appreciate this hearty, low calorie soup. In a nonstick skillet sprayed with olive oil in a mister bottle, cook chopped onion until soft and slightly browned. Add garlic and cook for one minute. Transfer onion and garlic to large stock pot. In the same skillet, brown ground beef. While the beef is cooking, add the chicken stock, beef stock, tomatoes, sauerkraut, water, brown sugar, Worcestershire sauce, bay leaves, parsley, sage, and pepper. When beef is cooked, add it to the stock pot. Bring soup to a boil, and then reduce heat to low. Simmer for 1 hour. Remove bay leaves. Serve soup with a dollop of sour cream if desired. This week is spring break for our family. It seems strange with all of the snow days we had earlier in the year, but our school has a guaranteed spring break. We don't have big travel plans this year. We are just staying home most of the time so Corey can go to track practice. He does have one college visit he's doing this week as well. Last year we spent the whole break visiting the schools at the top of his list. The menu this week is focused on using things we have in the pantry/freezer. One of the somewhat strange things I do when planning my menu each week is look at the week-long weather forecast. Weather tends to affect what I like to eat. :) Monday, it's supposed to snow and by Thursday it's supposed to be 76 degrees and sunny. Crazy Missouri spring weather! So, you will see more casserole/baked items earlier in the week and more grilling recipes later in the week. My lunch soup of the week is Creamy Tomato Soup. This is a nice fast dinner or hearty lunch option. 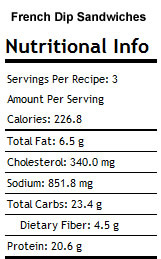 In a large, nonstick skillet, saute onion until softened. Add flour and whisk together. Add sherry and beef broth and whisk until smooth. Simmer over low heat for 5 minutes. Add the roast beef slices to the skillet and heat through. Place hamburger buns on baking sheet and put oven on broiler setting. 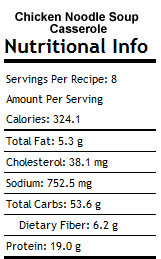 Pile six slices of beef on each hamburger bun. Top with a slice of cheese. Place in oven on broiler setting and heat until cheese is melted. 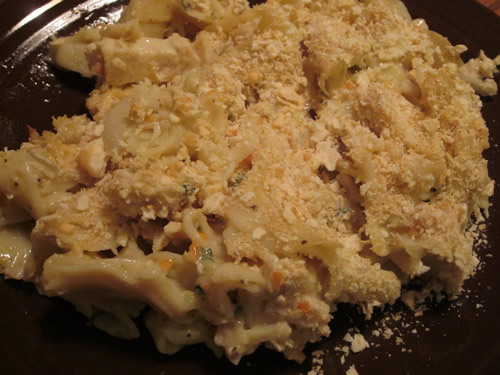 This casserole is very similar to my Comforting Chicken Noodle Soup. The crackers give it a nice crunch. Cook the noodles in boiling water according to package instructions. While the noodles are cooking, cut up the chicken into 1/2 inch pieces. Drain pasta and set aside. Finely chop onions, carrots and celery. In a pot saute onion, minced garlic, carrots, and celery. Cook until the onions appear translucent. Add the mushroom soup, chicken soup, and sour cream. Mix well. Add the noodles, chicken, pepper and parsley. Stir until fully coated. Transfer to a greased 9×13 pan. Bake at 350F for 30 minutes or until bubbly. Remove from oven and sprinkle with crackers and bake 5 – 10 more minutes. 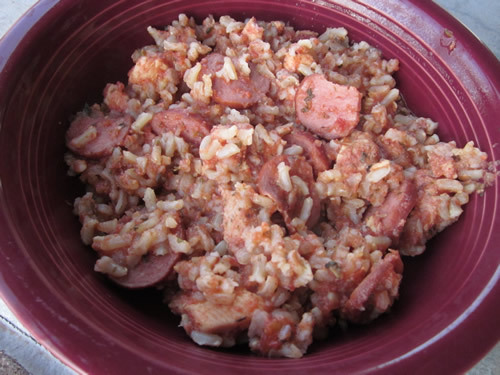 Yes, I know that traditionally Jambalaya has seafood/shrimp in it, but this recipe is good for my non-fish-eating son. It's spicy and filling and still has that Cajun feel to it. In a crock pot, mix the chicken, sausage, tomatoes, spices, and broth. Cover and cook 7 to 8 hours on low or 3 to 4 hours on high. Mix in cooked rice and cover for 15 minutes to warm through. This is a light and creamy dessert that my family loves. 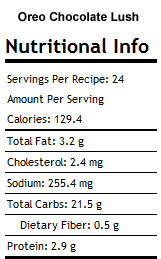 If you stick to the serving size, it's only 129 calories a piece. Process cookies in food processor until fine crumbs form (or pound in ziplock bag). Press onto bottom of 13 X 9 inch dish. Refrigerate until ready to use. 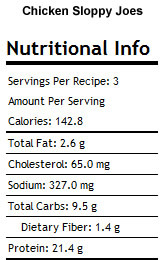 Whisk cream cheese, sugar, and 2 T milk in medium bowl until blended. Stir in 1 1/4 cups cool whip; spread over crust. Beat pudding mixes and 3 1/4 cups milk with whisk 2 min; pour over cream cheese layer. Let stand 5 min. or until thickened. Cover with remaining cool whip. Refrigerate 4 hours. Place dessert in freezer about 1 hour before cutting into squares to serve.